We love trains at our house... so we were really really excited to have The Little Engine That Could by Watty Piper be our January book for Virtual Book Club for Kids! We hosted a Little Engine that Could themed preschool book club a month or two ago and have several fun activities and crafts to share with you. 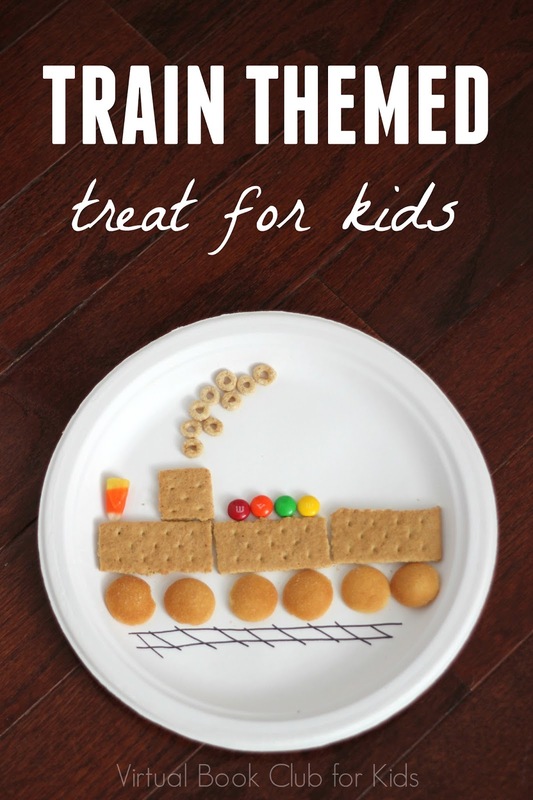 Today we wanted to start by sharing this easy peasy train themed treat we made using just a few items. To get started I drew train tracks on the bottom of each paper plate using a Sharpie. Then I showed the kids how they could use the graham crackers for the train cars and engine and the other items for the smoke, wheels, etc. The kids thought that the trains were so cool that very few of them actually ate their trains... they wanted to just save them to show their moms when they got picked up. I thought it was adorable. They ate some of the remnants of their snack items that they didn't include with their trains and we read The Little Engine That Could. We also did some train pretend play, made a train craft, and played a train name game. Make sure to stop by later today and check out some of our other train activities we did along with The Little Engine That Could. This activity is being featured as part of our January Virtual Book Club for Kids. You can click on any of the links below to see the train crafts and activities that some of the other Virtual Book Club for Kids co-hosts are up to this month. 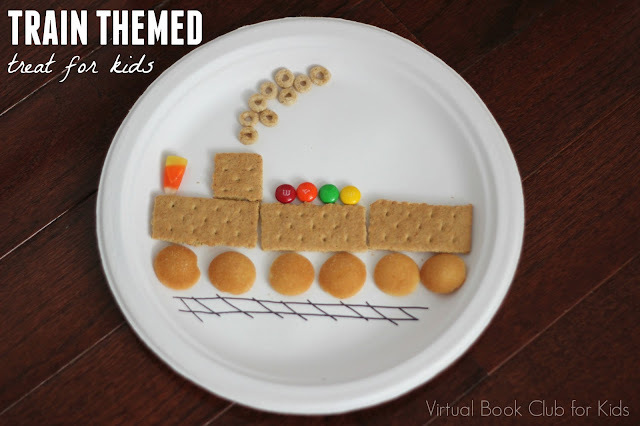 We have several other favorite VBC train themed activities featured in this Train Crafts and Activities post. How fun! We made a similar treat this week! This is such a cute treat! My kids would love it! Fun! I love how the kids can build and rearrange them too! What a fun snack idea my kids would love it. This is perfect for a book club on the go with friends at a park! So cute Kristina. Pinned to our cooking with kids board!